For the first time in six years, the Fordham Brewing Co. is adding a new, year-round beer to their drink portfolio: Rams Head IPA. This beer is particularly poignant, as it has provided the occasion to share the history of the Fordham Brewing Co. Named after Benjamin Fordham, Maryland’s first brewer, the brewery has always embraced the ethos of defying the ordinary, as Benjamin Fordham did when he immigrated to the United States in 1703 in support of the fledgling colony. When the Maryland- based Rams Head restaurant opted to open a brewery, they chose to honor this spirit of adventure. The Fordham Brewing Co. launched in the downtown Annapolis Rams Head in 1995, mere blocks from where Benjamin Fordham first brewed. After experiencing a 54% growth increase in 2002, the company made the decision to expand the scope of operations and separate from the restaurant, moving from Annapolis to a brand new facility in Dover, Delaware. When given the option to purchase the Old Dominion Brewery from Jerry Bailey in 2007, the brewery jumped at the chance to do something that no one else had done: merge two craft breweries while maintaining their separate identities. The leadership made the decision to take on the demands of a two-brand company, because it was out of the ordinary and because it challenged expectations. 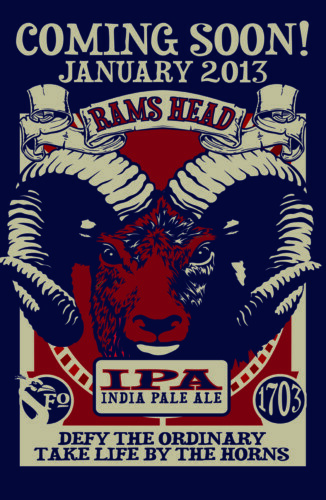 Rams Head IPA will be available in six-packs and on draft. It will hit shelves and taps in the Mid-Atlantic region in January 2013.